I am a professional scientist/University Professor. I have decades of experience writing for academic journals, but I am new to writing fiction. I don’t spend enough time fishing or writing fiction. That needs to change. Of course! What other response could an academician give? I was a good student, perhaps under challenged at times. I liked English, particularly sentenced structure and grammar. My focus was on the sciences, not on English. But reading is some of the best training for writing. Career may be too strong of a word. I hope to continue to have people enjoy my prose. I have never read much poetry, but I have read Walt Whitman. I would say less in was writing and more in perspective. I gleaned “be yourself” from Leaves of Grass. I have two short stories published right here on The Scarlet Leaf Review (The Hitman, April 2016; Stolen Life, July 2016). I have been experimenting with some Flash Fiction and have had a few published. My two short stories are available here on The Scarlet Leaf Review! I’m writing a series of middle group (MG) stories about the misadventures of two young teenage boys, “Me and Bart.” The stories are set in the late 1960’s when it was a simpler time with no cell phones and free-range kids. They go on escapades that result in harmless mischief. The stories are intended to entertain. There is no intent to deliver a moral message, just stories about rambunctious young boys. And of course, I’m still writing cozy mysteries. I don’t have any books, but I am planning to put “Me and Bart” stories into a book. Like everyone else, the best and most popular ones! So far, my stories settings are very familiar to me, so limited research is needed. I do research details to provide realism in my stories. For instance, how long does it take for a body to bleed out when the femoral artery is cut through. Q: Have you written any other novels/novellas in collaboration with other writers? Why did you do decide to collaborate and did that affect your sales? I have always enjoyed creative writing. I needed an outlet to escape from work pressures and just started. I have no set writing schedule, I write when I have the time, which is not often enough. Sometimes my ideas come from past experiences, but much of the time, events that occur trigger an idea. If I see a building being torn down, maybe there is a body in a wall cavity. That sort of thing. I don’t think I’ve been writing long enough to have evolved creatively, but I do feel my writing has improved. I do make sketchy notes for ideas, but I let the ideas take me directions as I am writing. Writing in a such a manner your reader sees and feels they are part of the story as they are reading. I don’t really know. Like most things, doing it well is not easy. If I am stumbling on a portion of a story, I put it aside and read something. I read short stories; my favorite genre is cozy. I tend to go more for the genre than specific authors. I do a great deal of professional reading and never seem to have enough time to read fiction. Q: What books are you reading at present? I’m reading short stories. The last few books I’ve read were nonfiction. I proofread and edit my own work, but that is not enough. I use the Scribophile site for editing and proofing. There are terrific writers on the site where critiques are exchanged. I’d recommend the site to anyone that wants to improve their writing. No, edit it as much as I can. It is difficult to edit your own work. As a final procedure, I use the voice-to-text option in Word for my final edit. Then I put it up on the Scribophile site. 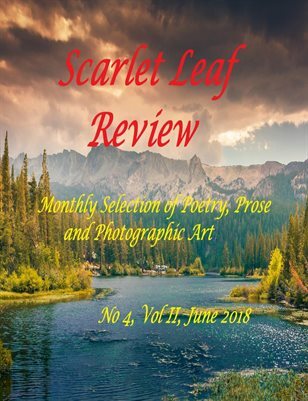 My short stories here on The Scarlet Leaf Review were critiques and edited on the Scribophile site. With my family. I like being outdoors. Sad to say, but it would be an academic text in my field. I have several. Most all the good quotes come from “The Wizard of Oz” or the “Star Wars” series of movies. Hopefully a better writer and possibly expanding my writing genre. Let’s just say that all past experiences contribute to one’s character. Wow, too many (none of them living) to narrow down to one. Because I’m a biologist, Origin of the Species by Charles Darwin. Get on a critique site, have a thick skin, and listen to advice on the site. Don’t expect to be a good writer when you start. Plan to get better to hopefully become a good writer. Like education, it is a journey, not a destination. More electronic publishing and less print; more self-publishing and less traditional publishing.